Food4Souls is a charitable organization that heads to downtown Indianapolis each Sunday afternoon to distribute food, clothing and other resources to the homeless. Community relations director Dawn is a long-time regular customer of our Fishers, Indiana pet center. One day she was in doing some personal shopping, and it occurred to her that the definition of "homeless" extended not only to humans, but to their four-legged family members as well. She asked store team leader David if he and the Fishers team would be willing to donate some pet food to the Food4Souls cause, and they responded with a resounding, pet-centric yes! So often we think of "homeless pets" as those dogs and cats who are in shelters, abandoned by one owner and waiting for another to come along. But there are those out there who are beloved and treasured pets who don't have a roof over their heads or food to eat, but still have an owner to love. Thanks to David and the Fishers team, their tummies are a little more full. Dawn sent along a picture of one grateful recipient. 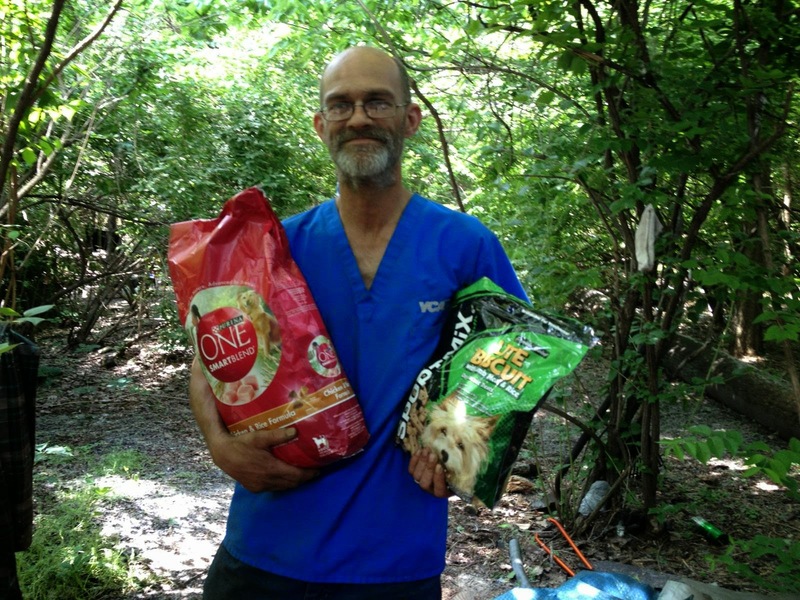 "He has two dogs and was very happy to receive the dog food Pet Supplies Plus donated," she told us. A big PSP round of applause goes out to Food4Souls for doing such great work in their community, and a huge paws-up to David and the Fishers team for discovering such a neighborly, pet-centric way to impact their community!